For applications (e.g. Touchstone-Pro and WifiSurveyor) that support data logging to CSV-formatted files, we’ve included an example of a VBA macro in the installation folder that can be used for viewing the CSV data as a waterfall / heatmap in Microsoft Excel. 1. Open the CSV log file in Excel. 3. Import the VBA macro HeatmapVBA.bas into Excel by selecting File / Import File… from the VBA editor menu and navigate to the application’s installation folder (e.g. C:\Program Files (x86)\NutsAboutNets\TouchstonePro) to locate the file. 4. Close the VBA editor window by selecting File / Close and return to Microsoft Excel. 5. Press Alt+F8 to display the Macro dialog box. 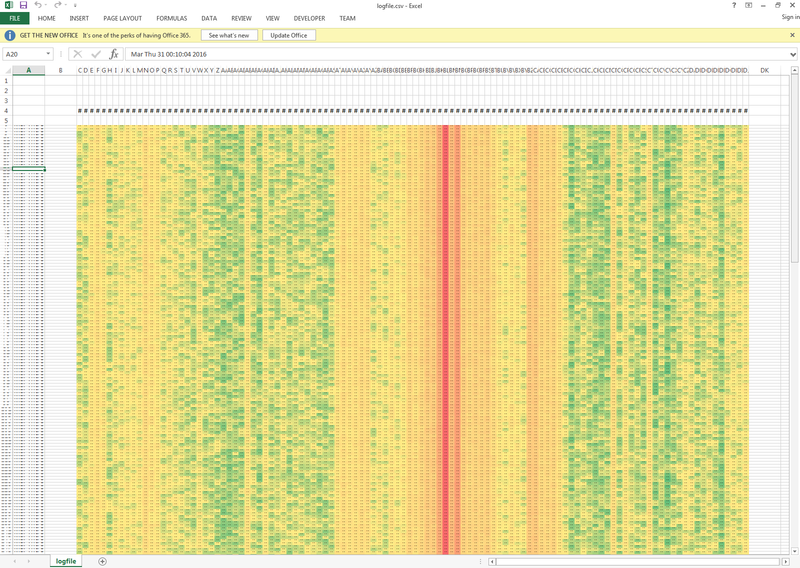 Select and run the macro Create_Heatmap_From_CSV. Excel makes it easy to retrieve the timestamp, frequency and signal strength from any point in the heatmap chart. To determine the timestamp of a particular point in the chart simply click along the left-most column, as shown below. 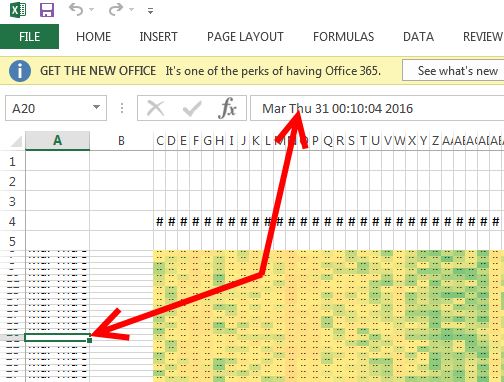 The timestamp is displayed in Excel’s Formula Bar. Similarly, to determine the frequency at a particular point in the chart click the corresponding column near the top of the chart, as shown below. The frequency, in MHz, is displayed in Excel’s Formula Bar. And, finally, to determine the signal strength at a particular point in the chart click the corresponding cell, as shown below. The signal strength, in dBm, is displayed in Excel’s formula bar.